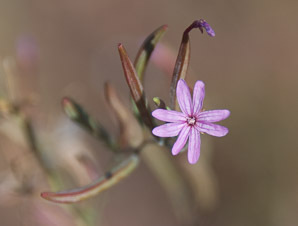 Epilobium paniculatum Nutt. ex Torr. & A. Gray var. juncundum (A. Gray) Trel. 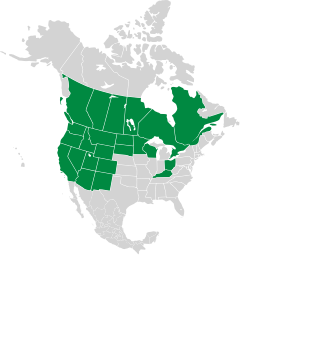 Tall willowherb is native to North America, found in much of Canada and in the western United States. Identification: Plants are up to 6' (1.8 m) in height. Leaves are up to 2½" (6.3 cm) long, narrow like grass blades, though somewhat wider in the middle, and often curving. Flowers are about ⅜" (9.5 mm) across, white to pink or purple. Flowers have four petals, but they usually look as if they have eight, because each petal is deeply notched. Seeds are suspended from white, fluffy parachutes. Epilobium brachycarpum description by Thomas H. Kent, last updated 25 Dec 2018.